This gorgeous home is located in Crescent Lakes neighborhood. Crescent Lakes has tennis courts, a huge playground, lakes and miles of sidewalks for great walks in the sun. The house has a formal living and dining room. The fully equipped kitchen is open to an eating nook and the family room. The pool lanai is accessible from many rooms. The family has a TV and free wifi is available. The master bedroom has a queen bed, a tv and a full ensuite bathroom. THe other other two bedrooms also have queen beds and tvs. These rooms share a hall bathroom that also leads out to the pool area. The pool is huge! The entire pool, deck and covered lanai are screened in and there are not any neighbors at the back. There is plenty of seating and a dining table as well. A BBQ is provided (you are responsible for cleaning and refilling propane as needed). The garage of this home is not available to guests. 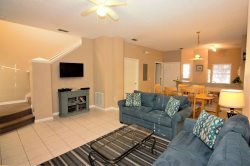 This home is a great home base for your stay in the Orlando area! Everyone that I spoke with was very helpful and friendly!!! I just talk with Angela Lozano and she was amazing , I want to tell tank you to her.